To make the chicken filling: Heat oven to 350 degrees Fahrenheit. Heat 1 teaspoon olive oil in a medium ovenproof skillet over medium-high heat. Season chicken with 1/4 teaspoon salt and chipotle pepper. Then, add to the heated pan and brown on both sides. Transfer skillet to the oven and bake until cooked through — about 15 minutes. Set aside. Heat remaining oil in a medium skillet, add the jalapeño, onion, and remaining salt, and cook over medium heat until softened — about 10 minutes. Transfer the mixture to a medium bowl. Shred the chicken and add it along with the lime juice, cilantro, and half of the goat cheese to the onions and stir gently to combine. 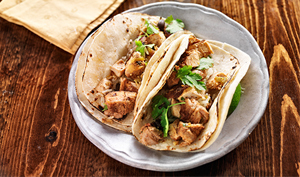 Fill taco shells with 2 teaspoons of filling, top with remaining cheese, garnish with cilantro, and serve immediately.